An Indian IT chief who's really made it big without dropping his ethical precepts by the wayside is Nagawara Ramarao Narayana Murthy, Chairman of Infosys. Born in 1946, Murthy's father was a schoolteacher in Kolar district, Karnataka, India. A bright student, Murthy went on to acquire a degree in Electrical Engineering from Mysore University and later studied Computer Science at the IIT, Kanpur, India. The Infosys legend began in 1981 when Narayana Murthy dreamt of forming his own company, along with six friends. There was a minor hitch, though-he didn't have any seed money. Luckily, like many Indian women who save secretly without their husband's knowledge, his wife Sudha-then an engineer with Tatas-had saved Rs 10,000. This was Murthy's first big break. The decade until 1991 was a tough period when the couple lived in a one-room house. The second break came in 1991 when Indian doors to liberalization were flung open… Murthy grabbed the opportunity with both hands and has never looked back ever since. Today, Infosys is the first Indian company to be listed on the US NASDAQ. 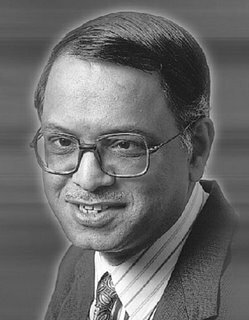 While working in France in the 1970s, Murthy was strongly influenced by socialism. The bubble was pricked, however, when he was arrested in Bulgaria on espionage charges. Today, he says: "I'm a capitalist in mind, a socialist at heart." It was this belief in the distribution of wealth that made Infosys one of the first Indian companies to offer employees stock-option plans. Infosys now has 400 employees who are dollar millionaires. In a poll conducted by Asiaweek, the quiet, soft-spoken man was selected one of the 50 most powerful people in Asia for 2000. And 50 per cent of the respondents in an online poll conducted by The Economic Times voted him the best CEO of India. 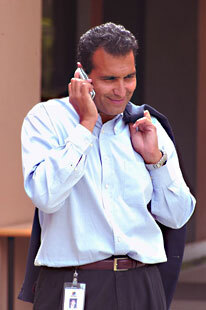 Heading a company with the largest market capitalization hasn't changed Murthy's life-style much. The man still doesn't know how to drive a car! On Saturdays-his driver's weekly off-the Infosys chief is driven to the bus stop by his wife, from where he boards a company bus to work! Incidentally, Sudha Murthy is now chief of the Infosys Foundation, which channels Rs 50 million into charity every year. Simplicity, humility and maintaining a low profile are the hallmarks of this super-rich Bangalorean. And the man is principled to a fault. Murthy's unprecedented wealth has catapulted him into the public glare. After the kidnapping of Dr Rajkumar by forest brigand Veerappan, the Home Ministry has sounded out the local government about providing Z-category security to Murthy and Premji. Both characteristically turned down the offer. In a letter to the police top brass last month, Murthy said he was a simple man who had no intentions of annoying his neighbors and disturbing traffic with an intrusive entourage of security vehicles and personnel. That's Narayana Murthy for you. 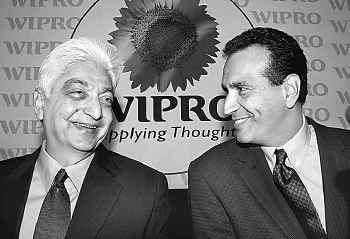 Vivek Paul (born 1958), an alumnus of BITS Pilani, and until recently the Vice Chairman of Wipro Limited and CEO of Wipro Technologies in India, was declared among the best managers in the world by the Business Week in 2004. He was also named by Time and CNN amongst the most influential business persons in the world. In 2005, he was named among the top 30 CEO's in the world by Barrons. Paul joined Wipro in 1999 as Vice Chairman of the company and CEO of its global information technology, product engineering, and business process services segments. Paul grew this business from under $150m in revenue to over $1b in 6 years.He was the highest paid Indian Executive during this term. Prior to this role, Paul was employed at GE for 10 years, where he was running GE's Global CT (Computerized Tomography) business, reporting directly to the current Chairman of GE. Paul also served as President and CEO of GE’s medical equipment joint venture in India. The joint venture was recognized by GE as among one of its best joint ventures in the world, and subsequently by the Economist as the best joint venture in Asia. Paul set up local distribution (direct and indirect) and service networks, and built manufacturing and design capability, making the joint venture a leader in its served market, a global source for ultrasound for GE, and India’s largest exporter of high value engineering goods. Prior to working at GE, Paul worked at Bain & Co., Boston, and at PepsiCo Inc., Purchase, NY. 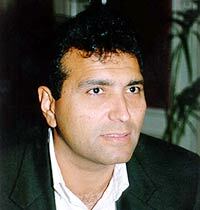 Paul received an MBA from the University of Massachusetts and a Bachelor of Engineering degree from BITS, Pilani, where he was also captain of its swim and water-polo teams. He went to the prestigious St. Columba's School in New Delhi. On May 5, Wipro vice chairman Vivek Paul walked into the second floor Bangalore offices of Wipro executive vice president (human resources), Pratik Kumar. The meeting was unscheduled. Paul told Kumar about a certain sense of 'restlessness' that had seized him lately. He disclosed how he 'was evaluating to do something else'. Kumar thought Paul was at a stage 'where he wanted to make a decision'. I am starting this new blog to write about the IT leaders i admired most. From now onwards, i will be writing and collecting resources from the various websites to post it here.